When President Teddy Roosevelt was a college student, he taught a Sunday School class for elementary school children. During this time, Roosevelt awarded a dollar to a boy in his Sunday School class for beating the snot out of a bully who tormented little girls. “You did exactly right,” said Roosevelt with pride. However, the congregation disagreed. They immediately dismissed Roosevelt for teaching the “un-Christian” principle of laying the smack down on those who have it coming to them.Well, if tradition is true, that little boy was also richly rewarded by Jolly Old Saint Nicholas since the good Saint Nick allegedly “h-slapped” (“heretic slapped”) the heresiarch Arius. You see, Arius wrongly taught that Christ was not fully divine but rather a mere creature. Arius taught that Christ had been created by God the Father. During the First Ecumenical Council of Nicea (AD 325), Arius was called upon to defend his position on the inferiority of Christ. Saint Nicholas just couldn’t listen to all of Arius’ nonsense and so he stood up and laid in to Arius with his fist. 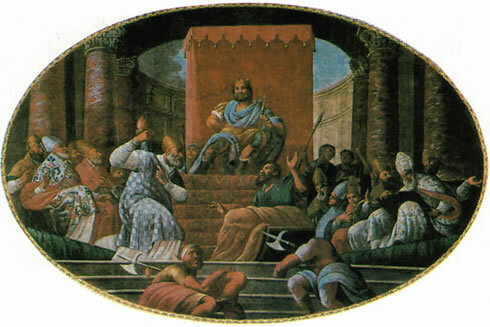 The Emperor Constantine and the bishops present at the Council were alarmed by Nicholas’ act of violence against Arius. They immediately stripped Nicholas of his office as a bishop by confiscating the two items that marked out a man as a Christian bishop: Nicholas’ personal copy of the Gospels and his pallium (the vestment worn by all bishops in the East). Now if that were the end of the story, we probably wouldn’t know about Saint Nicholas, and our children wouldn’t be asking him for presents. However, after Nicholas was deposed, the Lord Jesus Christ and the Blessed Virgin Mary visited Nicholas who was being held in a prison cell for his fist-fight with the heretic. Christ then presented Nicholas with his copy of the Gospels. Next, the Blessed Virgin vested Nicholas with his episcopal pallium, thus restoring him to his rank as a bishop. Nicholas is on the left holding up his fist, Arius is on the ground with his hands up. The guy on the throne is Constantine. This is my favorite story of Saint Nicholas. I have enjoyed sharing this event with people for years. Thank you. And what happened to him and I thank you very much for bringing this to my attention. I am presently on vacation and I have an order in to purchase the History of the first four centuries of the early church for my semenarian studies. I am now more eager then ever to sit down and enjoy these new books. Thanks for sharing and that icon it is beautiful. I would like to wish you a blessed Holy Christmas and a wonderful New Year. May God richly bless you and keep you in His tender loving care.